When you call us to deliver or to estimate a pumping system for your application, the following are questions you can expect to be asked in order to identify the right pump to get the job done efficiently and cost-effectively. This is a simple question, but it is important to know the specific situation. We have pumps to move acids, caustics, and even diesel fuel. Depending on the medium and its strength, we will make sure that you get a pump that will stand up to the job. Even pumping something as basic as water isn’t always simple. Water containing large amounts of abrasive materials (i.e. sand), solid materials (i.e. gravel, sanitary sewer), or clogging materials (i.e. leaves, toilet paper) needs proper consideration to avoid problems – or repairs – during the job. Moving a static amount or a constant volume of fluid makes selecting a pump a simple process. But handling jobs with varying amounts of fluid movement is where our expertise puts us ahead of the rest. Knowing the low level, normal level and high level flows will allow us to design a pumping system that handles each condition and provides cost savings. (Fuel is a significant but often overlooked expense when renting pumping equipment.) What do you do when those numbers are not known? Ask an expert! With a little information (pipe size, fluid level in the pipe, slope, velocity), we can calculate those numbers for you. 3) “What is the suction lift?" The overall length of the suction line means nothing (except for how long the pump will take to prime itself), but the vertical distance from the eye of the pump’s impeller to the water level is everything. Longer suction lifts diminish the capacity of the pump, and physics limits the pump to a maximum of 28 ft vertical of suction lift under ideal conditions. Jobs below that mark need a submersible pump instead. Another key component for selecting the right pump is the vertical distance between the pump and the highest point in the discharge line. This is often where the majority of the head in a pumping system is generated. And we also need to know the discharge length, not only so we can calculate dynamic head losses, but so we bring enough pipe to get the fluid where it needs to go! We can adapt to a number of different connection types: flange, NPT, NST and Camlock among others. And if the pump is pulling out of or pumping into a closed, pressurized system, we need to factor that pressure into the equation. An odd question? Not at all. Fluids begin to behave differently as their temperatures increase. If the fluid you need to move is warm to the touch, a temperature reading is a good idea. Not all hose and pipe are designed to be used for higher temperatures (above 140°F). Higher temperatures are also important to note for safety reasons. 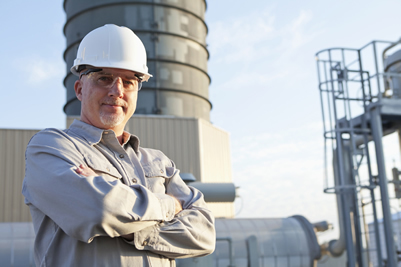 We are committed to safety and the biggest component to safety is knowing about potential concerns ahead of time. Will the pumps be pulling out of an open manhole, or over the wall of an open, above-ground tank? Is there equipment in the way that will force the pumps to be put in a certain area? There can be any number of logistical issues on a job site that, though they may not be complex, must be addressed. Often those issues center around where the pumps can be positioned so as to not fight each other and to stay out of the way of other work going on. Our experts can assist with recommendations to help address issues such as these. We are glad to make a visit to your job site to help design the pumping system, address logistical concerns, and point out important considerations that may not be obvious. 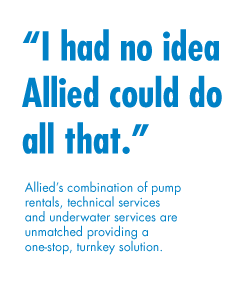 We are not in the business of just supplying pumps - we are your source for complete pumping solutions!